Once the Princess Designer Pin Set was released, Disney revealed that there would also be Limited Edition dolls to match coming soon. The internet was buzzing about these dolls, and with such high edition sizes like 6000 or 4000, it seemed like these dolls would be easy to come by. Well, guess again. I for one have been subjected to waiting all night for an item to be listed, the DisneyStore.com website not cooperating, hidden links, or "sorry this item is sold out" notices very often when buying Jessica pins. However, that was when we were talking about Limited Edition sizes of 250 or 100. You could imagine my shock to learn how fast the Disney Princess Designer dolls were selling out. Ariel, the second doll to be released, sold out in about a half hour. Snow White sold out in less than an hour. That is insanity! The other dolls (Cinderella, Belle and Mulan) also sold out very fast. "Due to the overwhelming demand for the Disney Princess Designer Doll Collection, DisneyStore.com experienced a system malfunction and the limited edition Snow White doll was oversold. We sincerely apologize for the inconvenience, and recognize that this did not meet the high quality guest service that our Guests have come to expect from Disney Store. To ensure a Magical guest experience in the future, we have delayed the release of the next Designer Doll, as we reevaluate our process to ensure that all guests have a fair opportunity to purchase these highly coveted dolls. Please check blog.disneystore.com andFacebook.com/disneystore and we will provide an update on the new release schedule by Friday, September 23. On behalf of the Disney Store team, we thank you for your continued support. -Jim Fielding, President of Disney Stores Worldwide"
The new plan, instead of releasing one doll each week, they are waiting until October 17th to release the remaining 5 dolls all at once, and guests will only be allowed one doll of each Princess. The next day there will be an allotment of dolls for sale on DisneyStore.com, with only one per customer allowed as well. As you could have imagined, people are not happy with this new arrangement either - leading people to believe there will be a "Black Friday" of sorts at certain Disney stores, with an even more difficult time buying them online. 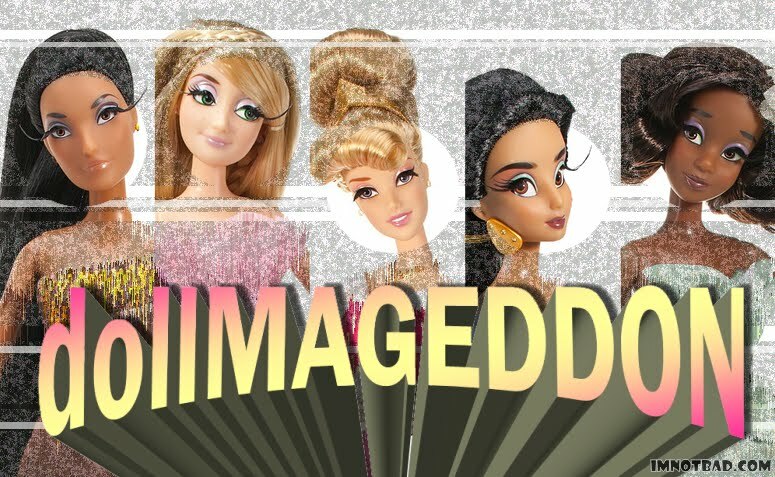 People are quite upset, opinions and rumors are flying around... dollMAGEDDON will strike in less than a month!! The top wanted Princess doll seems to be Rapunzel, with Jasmine at a close second. Right in the middle is Tiana, and on the short list of demands is Aurora and Pocahontas. Many pin collectors have little sympathy with this issue. With pins, this kind of happening was very common. So now, doll collectors join in on what Jessica pin collectors have had to deal with for a very long time now. This Disney Designer series did not stop at pins and dolls though - there are shirts, scarves, make-up, mugs, journals - and many other items which are also selling out quickly. However, many people are discussing that there are various top Disney characters not included in this line since they are not "Princesses." Tinker Bell is one name brought up often - leading many to wonder, could there be another Designer series in the future due to the overwhelming madness success of this line? I for one would love to see a Jessica Rabbit Designer Doll, along with other characters like Sally from Nightmare and Alice from Alice in Wonderland. There is also interest in Disney Villains like Maleficent from Sleeping Beauty. Either way - dollMAGEDDON will soon be upon us. You better check with your local store to see what time they are going to open on October 17th, or be right by your computer the next day on the 18th to try and nab the remaining five Princess dolls! 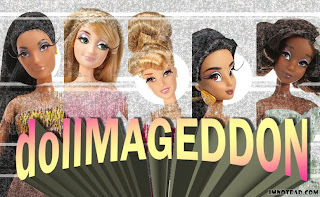 **UPDATE** An event that seems to be going down in Disney Store history - dollMAGEDDON finally happened on 10/17/11 at almost all Disney Store locations first. From various reports, people were lining up as early as midnight, waiting in their cars, hiding in bushes, and sneaking past security - all for the chance to buy the dolls. (I'm not joking) Stores got a certain amount of dolls of each princess, usually between 10 - 20 dolls. Many people reported some stores had 40 people in line when they arrived at early a.m. hours. Others overheard people in the front of the lines gloating about how they were just going to sell the dolls on eBay later. Then there were further frustrations when many customers missed out on getting any dolls by only being a little too far back on the line. The dolls were limited to one of each doll per customer, and it seems everyone who was able to was buying a full set of five. "Site is back up, however traffic is still at historic levels. Access will be sporadic." "Demand for our Designer Dolls is unprecedented. Access to our site will be restricted for approx 10 min. Thank you for your patience." "We can now confirm Aurora and Rapunzel Designer Dolls are sold out." "We've confirmed that Jasmine is now sold out." "We've confirmed that the Pocahontas Designer Doll is now sold out"
"All Designer Dolls have sold out. We understand the experience was poor for many, and we're sorry. Thank you for your patience and feedback." Many customers were extremely frustrated because they were not able to get ANY of the five dolls available due to the site malfunctions and crashing. Either way dollMAGEDDON has come and gone, and the dolls now sell on eBay for at least twice their original price.